In early 2012, a large new dome-like building started construction in Cambridge, New Zealand, about 20 kilometre southeast of Alsco‘s branch in Hamilton. 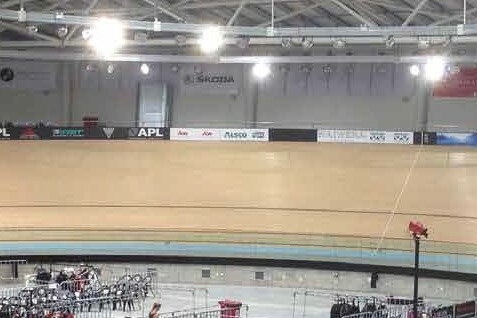 Like any intrepid Sales Executive, Gerard Pollock started making enquiries while the concrete foundations were barely even dry, and discovered that the new building was destined to be the new ‘home of excellence’ for New Zealand’s national cycling team. A plan was put in place between Gerard, Ron Kemp (Branch Manager, Hamilton) and Daniel Smith (Business Manager, Non-Textile Services) to ensure Alsco and our services were part of this new facility. Fast forward through 12 months, many presentations, and even more of our famous Kiwi ‘flat white’ coffees, and Alsco Hamilton became a sponsor of the new Avantidrome – NZ Home of Cycling. The massive new facility, one of only three such Olympic-grade sites in the southern hemisphere, now sports Alsco signage at multiple points around the track, ensuring national exposure for Alsco in NZ every time events are held at the Avantidrome. The official opening on April 12 saw the Avantidrome host the Royals, Kate and William, who completed the official ceremony along with Prime Minister John Key. … for the Avantidrome itself and its many tenants. Tenants include High Performance Sport NZ, Bike NZ, TriNZ, Waikato University High Performance Sport Unit, Rowing NZ, Canoe NZ. The Avantidrome has been set up using the latest innovations Alsco has to offer – Managed Civil Defence Systems, Tork supplied Automatic ‘No-Touch’ Consumable Dispensers, and washrooms with colour coordinated dispensers throughout. As this facility is rapidly expanding, with plans to use the Avantidrome as the starting point for a new ‘hyper’ sports facility to host many of NZ’s national Olympic sports teams (such as rowing, cycling and running). Alsco looks forward to increasing exposure nationally as the Avantidrome and subsequent facilities garner more and more coverage in the national media, and Alsco’s services and branding along with it. Alsco had had great support from its suppliers, Tork and Amtech in the supply of dispensers to complete this project. Since part of Alsco’s agreement with Avantidrome includes the right for Alsco to host conferences and events at the facility at no charge, if you visit Hamilton, New Zealand in the future for work or pleasure, you may just get to see this fantastic new facility and Alsco’s involvement in it… and maybe, if you’re brave enough you’ll be able to jump on a bike and hurtle round the track for a bit!